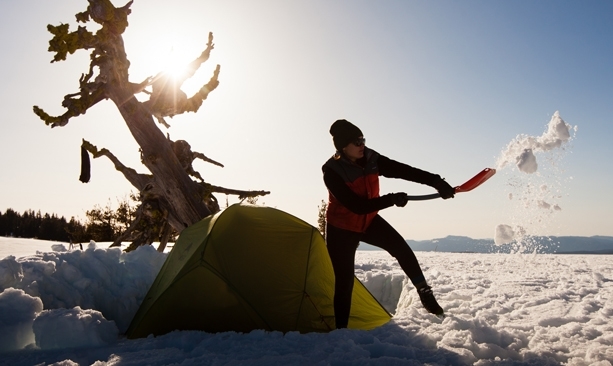 It’s generally not cool to wake up your tent mate, especially on a winter camping trip when it’s really cold and very early. 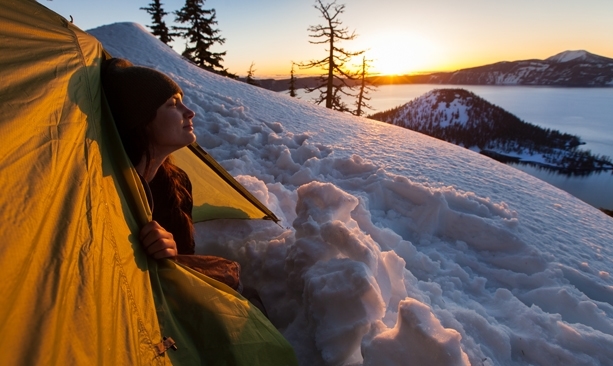 But the stunning sunrise over Crater Lake isn’t something you see every day, so I shook my husband, Brendan, awake. From the door of our tent, we had a perfect view of the deepest lake in the U.S., set in the sunken caldera of an ancient volcano. As the sun eased over the eastern rim, the snow around our campsite blushed pink, and Wizard Island, the tree-studded cinder cone in the lake, glowed a bluish white. Not a bad way to begin our second day of cross-country skiing. This was our first trip to Crater Lake. And while its exquisite beauty lands it on many must-see lists, I’ve always imagined a winter visit when an average 44 feet of snow covers the rim road, closes the north entrance and thins the crowds. We plotted a three-day clockwise course around the 30-mile Rim Drive, hoping for an extreme experience of this national icon. The rising sun lights up the snow and the water around Wizard Island. 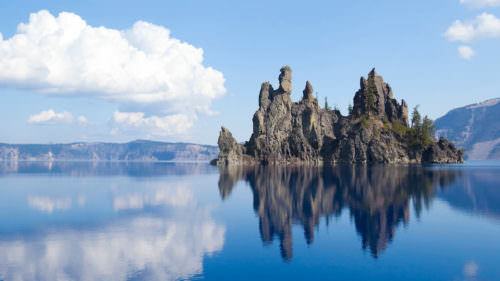 I’ve always dreamed of a winter visit to Crater Lake when an average 44 feet of snow covers the rim road and blankets tree-studded Wizard Island, the cinder cone in the caldera waters. “Well, I got what I came for,” I thought later that morning as I struggled over an avalanche bypass in a chilly headwind with my skis strapped to my pack. 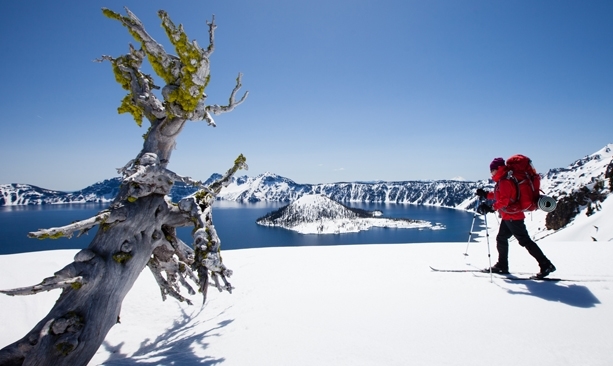 To visit Crater Lake on skis is, unmistakably, a backcountry trip and not a leisurely cross-country ski. The route contains four avalanche areas that must be bypassed or climbed over. A careless moment can mean a lost glove or ski. The day we set out, another group was forced to turn back when its sled full of gear slid off the trail and into the caldera. Luck was with us on this day. Though the wind kept up, the sky remained cloudless, and the sun cut through the chill as we headed out from our first campsite near Wizard Island Overlook toward the north side of the lake. We sped along the trail with Diamond Peak and Mount Thielsen rising up in the north. The lake disappeared from view for miles at a time behind the steep, snow-covered cliffs of the caldera, then exploded into view — a deep navy blue against the snow. Wind-sculpted trees, bent double and weathered gray, provided a windbreak for lunch at North Junction (mile 6.5). We saw no one and nothing but a bold crow that stalked up during lunch, cocked his shiny head at us and leaped into the air to somersault off into the wind. At Steel Bay (mile 8.5), we found the basalt wall at the overlook exposed. Packs off, stretched out in the sun, we gazed at the backside of Wizard Island and listened to the sound of the wind in the trees. 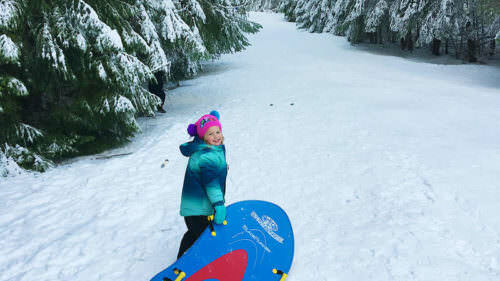 For the rest of the day, we skied along corridors lined with trees worried into Dr. Seuss-like shapes by the wind. Along the way, we watched great undulating waves surging across the water. 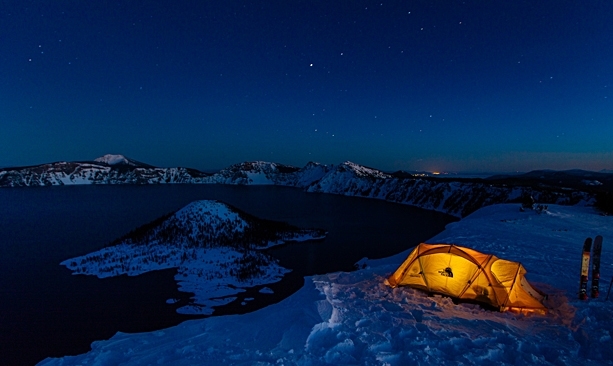 To visit Crater Lake on skis is, unmistakably, a backcountry trip and not a leisurely cross-country ski. We plotted a three-day course around the 30-mile Rim Drive, hoping for an extreme experience of this national icon. 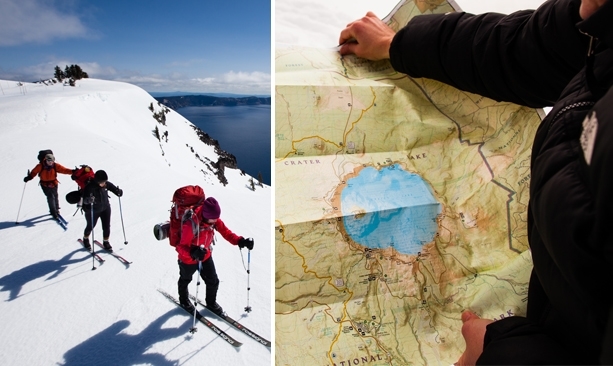 Only half of the 200 snowshoers and skiers who attempt the route each year make it. Others are turned back by bad weather. We got lucky with sunshine and blue skies. While Brendan dug out a tent spot near the Palisades (mile 13) and fashioned a kitchen out of snow, I cooked a quick dinner, hopping from foot to foot, confirming that I’d brought the wrong camp shoes. I was tucked into my sleeping bag to watch the sun set and the water blacken when we heard the sound of approaching skis. A headlamp appeared, followed by the cheerful greeting of a lone skier moving very fast. “Hello!” he called. We were camped on pavement where the snow had thawed, and he paused long enough to remove his skis, cross the pavement back to the snow and put his skis back on, all the while chattering about his trip: He was skiing around the lake in one night. By himself. It would take him 10 hours. He did it every year on the full moon. We should try it! And he called goodbye over his shoulder as he raced off into the moonlit shadows. “Don’t get any crazy ideas,” I said to Brendan, inching deeper into the warmth of my bag. The next day our route climbed up to about 7,800 feet, and we passed several scenic overlooks on the east side of the lake — Pumice Castle, Castle Rock and Sentinel Rock. At Kerr Notch, we gazed down on the wild rock formation of the island called Phantom Ship. The wind dropped off, and as the sun climbed in the sky, we were soon stripped down to shirtsleeves. As the trail wound away from the rim and out of sight of the water for miles at a time, we found open snowfields and pristine angles that made us wish for telemark skis and skins. We passed two more avalanche areas and arrived at Sun Notch (mile 26) in late afternoon, electing to camp one last night on the rim. We settled in for the night, watching another glorious sunset, this time with an encore as it slid behind Eagle Point, then popped out again for a brief time over Sun Notch before dipping into the black waters. Digging out the campsite each night proved worthwhile. Clear skies created gorgeous sunsets and tranquil twilight evenings. At first light we agreed to bail fast. It seemed like a concession to skip coffee, but it was soon clear that we had no option. When Brendan got out, the tent, now lightened of his weight, slid forward in the wind and landed — with me — in the deep kitchen trench I’d mocked him for digging. We fought the wind, shoving our gear into our packs at record speed, wary of the now icy slope at our feet. The wind pushed us along the final four miles of our trip in just an hour. Back at the Steel Visitor Center, we brewed coffee in the parking lot and enjoyed the warming temperatures and bright blue skies. 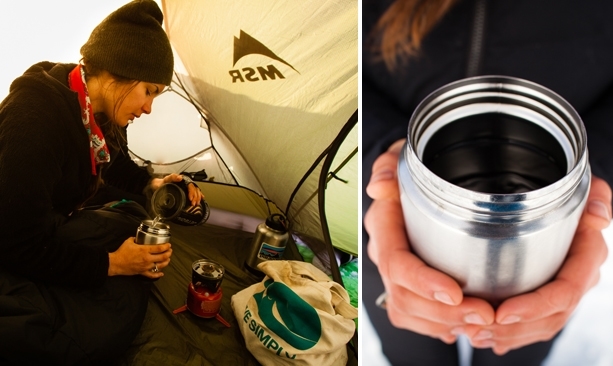 Preparing morning coffee in the tent gets the day started. 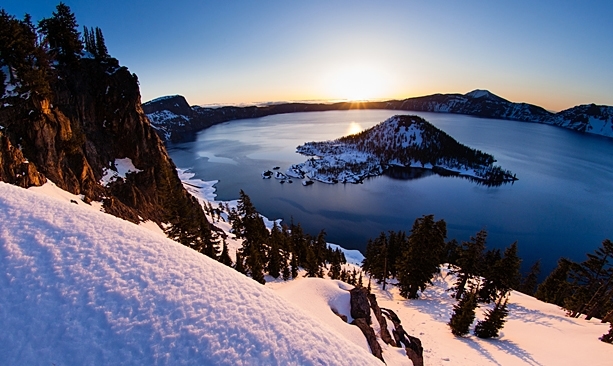 The stunning sunrise over Crater Lake isn’t something you see every day. Season: Skiers circle the lake from November until May when the road gets plowed for summer visitors. For the best weather, the optimal go-time is late spring. 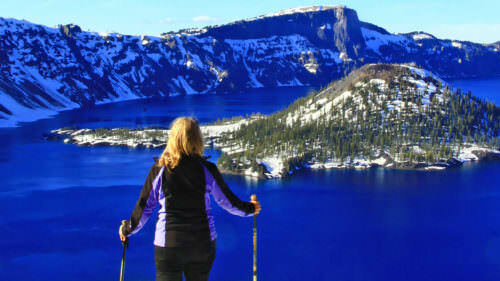 No lodging, food or services are available at Crater Lake from October through May. The Steel Visitor Center is open year-round. 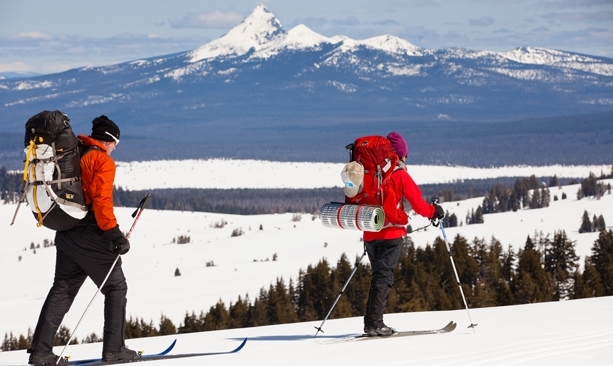 For a mellower winter option, contact the visitor center about ranger-guided snowshoe trips. Route and safety: Most people ski counterclockwise from the Rim Village. Three days and three nights is a good timeframe for an experienced skier in good shape. Because of unpredictable weather, skiers should have route-finding experience and tools with them. The park is not patrolled in the winter, so you are on your own. 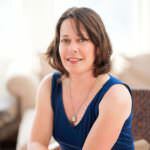 Before driving, look at road conditions on TripCheck. Parking: Drop off your gear at the Rim Village, and shuttle your car back to the visitor center to avoid having to ski the very steep Raven Trail at the end of the tour. Camping and permits: Off-season, you can camp along Rim Road following leave-no-trace practices. You must stop in at the visitor center to get a backcountry permit (there’s no cost) and drop it off when you return. 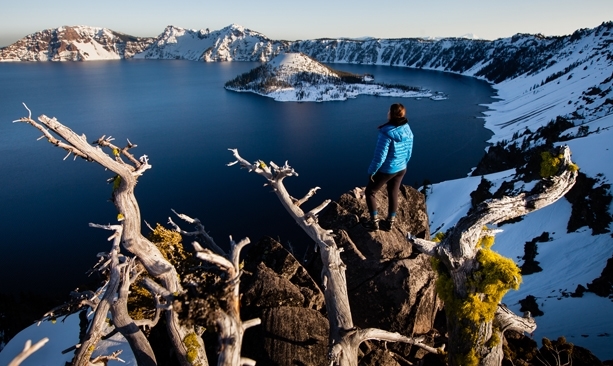 When is the best time to visit Crater Lake?